Most of us are living in climates that are different than the native environments of many of the geckos we keep. When we set up our geckos in their homes we all face certain challenges particularly in providing the appropriate heat and humidity. 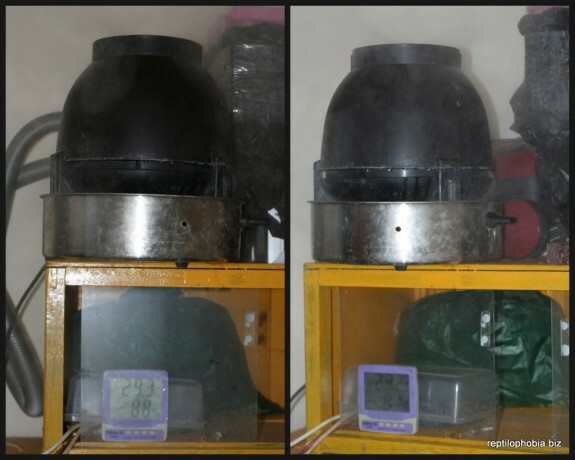 In this article, Gecko Time looks at the even greater challenges facing keepers who live in extreme climates: very cold climates with dry heat that significantly reduces humidity, and very hot and humid climates. Where do you live and what is the climate like during the year? What do you do in your home to make the environment comfortable for humans? 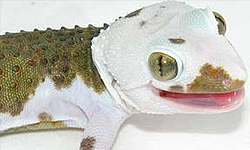 What kind of geckos do you keep and how do you keep them (i.e. racks, cages, what kind of cages)? What kind of challenges do you find keeping your reptiles comfortable in terms of temperature, humidity or anything else? As you’ve gained experience keeping geckos, have you had to make any adjustments to insure that the climate in their enclosures is comfortable for them? Is there anything else that you feel is unique to your environment that you need to take into account or that affects your geckos? We live on the Kenai Peninsula in Alaska, known for the world class fishing. The summers are nice and rarely ever spike over 75 degrees F. Our summers generally run for 3 months with winter consuming 6 months and fall and spring lasting a total of the other 3 months. Anything above 40F degrees is shorts and tee shirt weather for us up here. The winter-time can dip to a chilly -20F easily, To make the house a bit warmer during those chilly days and nights we try to keep our heater turned full blast; having large windows and a vaulted ceiling we seem to lose heat somewhat quickly. When the wind chill nips at your heels we turn on the oven from time to time and leave it open for awhile. I know that it’s not how most heat their home but when you need heat you need heat. There is no way a small space heater can do the job. We only have our one gecko. I wasn’t sure what type he was nor was I sure of his appropriate habitat so I had some reading to do when we bought him second-hand. I was pleased to learn ours is a Blizzard morph of a leopard gecko. We keep him in what was initially a fish tank type aquarium. He came in a 10 gallon tank and was way too large for it. Then he was moved to a 50 gallon tank which was too tall with not enough square feet of floor room. Now he is happy in a 30 gallon tank, which is perfect for him to have some hunting and stretching room. To keep it as little challenging as possible I actually take time and watch our gecko. Up here in Alaska where we live the humidity levels are very very low, so his moist hide is often dry in a matter of less then a week. And his water bowl can dry quickly if not watched closely, for that reason of watching him and his temperature carefully, I have his tank in the middle of the house, towards the living room. To help with the drastic temperature change I didn’t place his enclosure near doors or windows just for the chill factor and drafts, in hopes of keeping a good ambient temperature for him. I also have the enclosure at waist level to help with air temperature. A few times we have lost power due to a large amount of snow or downed line for some reason another so I keep a single leather mitten with sheep fur handy in case the power doesn’t come back on quickly. I can place it in his cage for a place to hide and keep warm. I assume it would hold heat better than his hide for the long term. On that note I do have a power supply that stores power just in case all goes black; at least his heat mat can run for about an hour. The only other issue I have is that being in Alaska we face many problems with shipping and weather. Once we had a bad storm for a few days and couldn’t get a shipment of crickets to the local pet store. Several days later they arrived. During that time of fasting my gecko was on a meal worm only diet. Now I make sure I have a few backups just in case. The worms store well long term far better than the crickets but I’m also in the process of learning how to breed my own crickets, just to err on the side of caution. We first got our gecko from an online ad from a family who was moving. They had him posted for 40 bucks and if he wasn’t sold they were going to let him go into the wild. Shocked by the fact they actually thought he could survive on his own, I figured we could spare his life for a small fee. I never thought we’d love the little guy like we do. He came in a ten gallon tank which I learned was too small for his size, and also had sand which I learned was not the best for him. Then the first owners told me he only ate meal worms, and didn’t have a moist hide. They had a heat lamp, etc..etc…. So after I did some reading on online forums and magazines and such I was amazed that everything he had was pretty much wrong. Wanting to offer him the right environment I set out to make it the best I could. I’ve added a small fan that blows down gently to move the air if it gets too humid in his tank. Since he is close to the kitchen sometimes it can get warm with water boiling and the oven going. The fan’s not always on but can be if needed. I’ve added plant life to his tank and to make sure all humidity levels and temperatures are correct I check them often. I live in Anchorage, Alaska, South Anchorage to be exact, but that does not mean we are any warmer….just closer to the south edge of Anchorage. We like to say we have three seasons: WINTER, BREAK-UP, and CONSTRUCTION. If we have a summer and it comes on a weekend we barbecue! To make the environment comfortable for humans in the house we have forced air heating which is set to keep the ambient temperature at 72F, a large humidifier in each room, lots of plants, and a clean air machine that produces negative ions which cleans particles out of the air. We have changed all light fixtures in every room to fluorescent and use Vita-lite bulbs. All of the ceilings in MY house are painted blue with white clouds sponged on and at least one wall of every room has a complete wall mural of a forest type scene. What was at one time considered the dining room is totally muraled off as in all four walls and is my favorite room. My intent is to totally mural every wall in the house so I have the inside of my house looking like I wish the outside was. We have electric outages due to weather and a few other unpredictable reasons. We never know when it may occur nor once it happens how long it will last, but we do have a plan. As soon as lights go out I run to the bathroom and fill the bathtub and sink up with all the HOT water left in the heater. If there is hot water still left when the tub is filled I start filling water bottles with hot water. These come in useful as I put my reptile collection into separate bags (fabric bags in a few sizes made to put individuals in. I never put more than one gecko in a bag as this is a stress situation for them as for me and while I don’t mind snapping at the people I live with I DO MIND my geckos snapping at each other). Several bags may be put into a tote with a hot water bottle to give off heat. I have a plethora (LOTS) of thermometers so I can keep track of each box on the inside and in the room. I have weather stripping installed on the bathroom door like it was an outside door so it retains as much heat from the tub and boxes with heated water in them. I have a flashlight next to every tank, enclosure or habitat PLUS one next to every light switch. I buy batteries by the case. This helps in getting my collection…well collected into bags and into the bathroom as fast as possible. I have a battery and a gas operated generator as a last resort for when the black out lasts longer than the heat of the water. The gas generator has to stay out on the porch and an extension cord is run for power to run a room heater. We also use our propane powered barbecue to heat large vats of water so we can keep replacing the water in the bottles and even the sink and tub. I have hooks in the walls of the bathroom to hang bags from and an extra rod hung over the middle of the bathtub to hang bags from..it is vital to put a thermometer on the outside of each bag. I use the stickable ones used for fish tanks but I don’t peal off the paper to reveal the stickieness but instead I use a piece of double sided sticky tape to tape the thermometer to the outside of each bag. I want them warm not cooked. I don’t believe the darkness scares them and the bag gives them security like they were in a hidy-hole or cave. A few years ago I was able to get up early on black Friday and get flashlights that sit on a tripod with a flexible head so it can be bent to the area I want. They are normally about $25 and I got them for $5 each so I spent a couple of hundred dollars and got so many that I still have some in the box so I can grab a new one instead of trying to fix a bulb that has gone bad. Once lights come on I will worry later about the bad light bulbs AND since putting my geckos back and inspecting each as I do is more important. I have a pile of flashlights that soon (I hope) I will get inspired to replace the bad bulbs in them. Till then I still have a few new ones still in boxes. Getting my geckos back into their homes IS important but, again, I check the thermometers in their enclosures to ensure I am not putting them into a cold home as it takes a while for their heaters to get back to full strength and also heat the substrate and any rocks or décor in the enclosure is at least not cold since in the middle of winter we can be talking temps of minus 50 degrees and if the electricity is off for hours or G-d forbid days, everything not in the warm room is indeed COLD. The glass of tanks is cold, the decorations are cold, substrate is cold, sometimes the water in their dishes is actually frozen. Unless the electricity is out for more than a week I don’t try to feed them but I do mist with warm water daily. If it is lights out for more than a week I do take one out at a time and put in small plastic tote in warm bathroom and feed them one by one. I move all worm bins, cricket totes, and roach totes to the warm bathroom also. THAT is all just for my herps. What I do for my freezer, refridge, water pipes and my son would take another couple of thousand words. I live in the Philippines where the climate is warm and humid for most of the year. During Nov-Jan months, temperatures could drop to 70 degrees (21 deg. Celsius) at night and early morning and heat up to 93.2 degrees (34 deg. Celsius) by noon. Average temperatures at home stay between 75 and 84 degrees. Basically air conditioning is on during the daytime. Electric fans are on and windows are all open at night. I have a female flying gecko (Ptychozoon intermedia), 3 mourning geckos (my breeder feeders), a female tokay gecko and a male leopard gecko (albino tremper reverse stripe). All are kept in glass tanks between 5 to 25 gallons with wire mesh tops. Challenges to keeping my geckos include being able to reduce the heat. During the dry summer season (Mar-May) temperatures go as high up as 108 degrees. 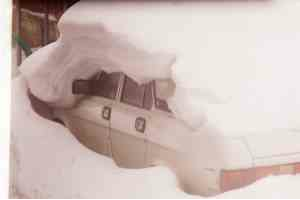 Air conditioning resolves this problem. Keeping too much humidity/moisture out is also a challenge as it attracts a lot of ants, mites and fruit flies. Using mesh tops for full ventilation corrects this. Moving tanks away from walls and windows are also a challenge during the summer. I lost a few reptiles this year due to heat exhaustion. I have learned to make adjustments to insure that the climate in their enclosures is comfortable for them. For species that like high humidity I keep their substrate dry, put 2-3 water bowls inside then place a glass cover on top. No heat lamps or under tank heaters required. The heat and high humidity at night time is a special feature of my native climate. I don’t use or find the need for a moist hide for leopard geckos. They shed normally here under room temp/humidity. We rarely encounter shedding problems here. Darkness, cool temperatures and noise from the roof due to heavy rain during the rainy season also affects the geckos here. My leo has hidden inside his hide for 2 weeks straight when it rained constantly here and since I am not using any supplemental heating, a noticeable sluggishness in movement can be observed if ever he comes out of hiding during this period to drink. Not a cause to be concerned though. I live in Surabaya, East Java, Indonesia (tropical). Since Surabaya is located on the coast, temperatures are generally quite hot in our area, and range between 31oC – 33oC (either morning or evening). During the course of the year, there can sometimes be quite drastic temperature changes i.e in the morning and at noon the temperatures are very hot (35°C – 38°C) and nights are quite cold (23 oC – 26oC). To be comfortable with such temperature conditions (usually hot), the place where we live has wide windows for air ventilation and the roof of our house is ​​high. But this year, when the temperature has been really high (hot / 35°C – 38°C), we also turn on the air conditioner at night time only. Our main project for several years has been the leopard geckos. 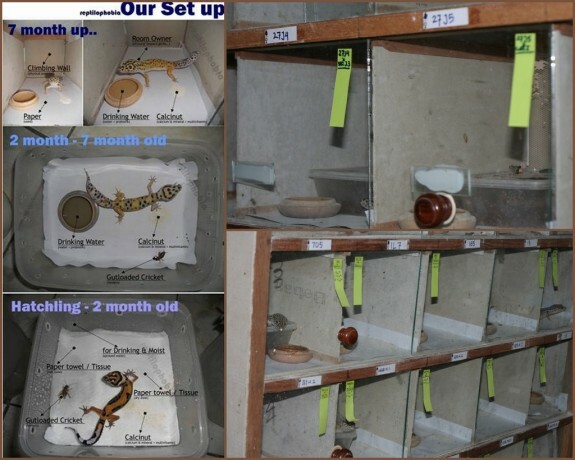 We use 3 types of cage depending on the gecko’s age: when newly hatched until 2 months old we use plastic cages with size 16 cm long x 16 cm wide x 8 cm high. We use paper towel as a substrate, and the gecko drinks only water droplets that we spray every 2 days on the enclosure wall. Then between the ages of 2 months to 7 months, we use a larger plastic enclosure, size 28 cm x 20 cm x 10 cm. For these two types of cages we use paper as substrate, a water bowl for drinking, for calcium and vitamin needs we place some above the paper substrate so they can lick it when needed, and at 7 months old and up, we move them to a glass enclosure (to simplify the process of observation in order to see the behavior, the conditions and their development). Each of these enclosures is 30 cm x 20 cm x 20 cm. We use wire netting (plastic coated or painted so the leopard gecko’s nails will not be harmed) at the rear of the enclosure, to optimize the air circulation of each enclosure. The use of wire netting is also intended for the leos to climb and train their muscles. Besides cage design the other things that we provide are similar to the second type of enclosure (large plastic enclosure). For us, this method has proven effective for 6 years (until now). 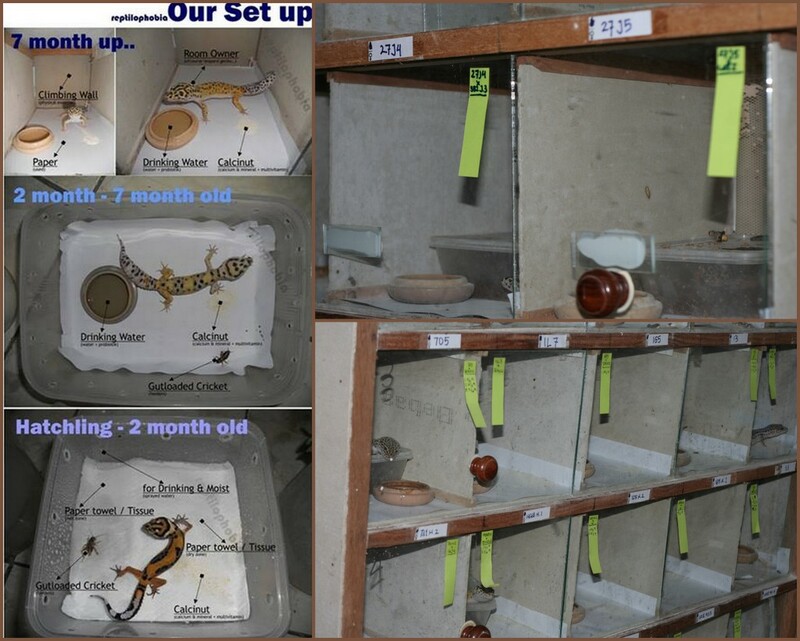 In the early days before we used this method, many leopard gecko problems arose as a result of our previous husbandry; because of thet we improved our observation and changed our methods. 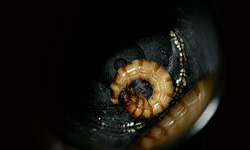 For example, every other day we feed 2-3 crickets to the leopard gecko new hatchling until it reaches 2 months and then every 3 days for those above the age of 2 months until adult we feed 5 -7 crickets that have been first gutloaded. We add probiotics to the drinking water and change it every 3 days at the time when we are giving them a meal. In addition to drastic temperature changes of the unique environment here there are unexpected power outages, so we have to find creative and affordable ways that can still maintain and provide for the geckos’ needs. 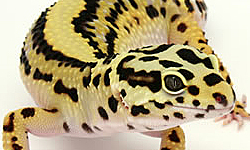 Indeed, the environment is a major factor in the health and life observations leopard gecko, but we believe, if we provide the safe substrate, the intake of rich nutrients, immune and mental endurance it could be a good way to prevent the problems that are not expected. From good observation and the learning process (which often takes a long time) we believe that quality results will follow. David Marshall is a 29 year old native of California who moved to Alaska with his family in 1994, David’s wife Amanda and their daughter Abigail care for their Blizzard Leopard Gecko with love and care. David is a tattoo artist so he is often creating new cage designs and layouts for their gecko. He enjoys building things you can’t find or buy at the store. At six foot nine when David holds Randall it’s a sight to see such a large person with a small animal but don’t let size fool you: there are tons of love that gecko can give. Randall seems to have an affection for David. When Randall is crawling freely he often makes his way straight to David. Abigail is also great with the gecko for only being 4 years old now. She listen’s very well and handles him with care. Randall responds very well to the quick actions and often not too subtle hand movements of a child. David went through another heart surgery and was gone out of state. During that time Amanda would take care of the child and the pets. Not liking the crickets and worms that Randall eats she would purchase them and Abigail would be the one to actually place the food in the tank, proving that geckos are easy and family friendly pets. David was glad to return to a happy and healthy gecko. Neil is an online real estate broker living in Bahrain and the Philippines. He specializes in keeping tropical Asian snakes and lizards amongst other animals for more research regarding reptile behavior and mild venom. He is a member and admin to the Philippine Snake Society and an assistant research associate/foreign online correspondent to Dr. Rafe Brown (University of Kansas, Biodiversity Institute-Herpetology Division). Aria Surya a.k.a “aquariyax”, lives in Surabaya, Indonesia. He is a reptile hobbyist and his main focus is on breeding and developing leopard geckos, burmese pythons and boa constrictors. He also produces his own gut load (RPG Essential), calcium and vitamin supplements (calcinut) and liquid probiotics (re.bio) which is used to maintain and sustain the health and development of his pets. In 2009 he established a brand called “reptilophobia” (the name was chosen because previously he had a phobia of reptiles but subsequently fell in love and has learned even more, especially about the reptiles that he has kept). Sharon D. Webb started in the pet industry at age 18 (she is now 60+) when she was hired to close the first pet store in Alaska. She turned sales around and bought the shop and turned it into the largest Pet Store in Alaska. the Anchorage Pet Palace. She has owned 3 different Pet stores, each with a grooming parlor and an isolation room for those needing TLC. She was the first person in the state to have Burmese pythons mate and lay eggs. She breeds most of her own live feeders and is in the process of opening Alaska’s first reptile spa; which will include large, long tanks with water current for people to rent for their snakes, iquanas, and other water lovers to swim and get exercise. For 4 years she had a talk radio show called: Pet Talk; which was very popular. She has been a fixture in the pet industry in Alaska for over 40 years. She is proud to have been bitten and pooped on by some of the coolest critters in the world. She believes that: Pets are People Too!!! She hopes that the breeders of today will start keeping pedigrees and birthdates on the babies they sell.